Today I want to share my Singapore Vlog and guide with you (finally!). Singapore was the first destination on my trip around the world, which started today, exactly one month ago. I truly felt in love with Singapore and will travel back to Singapore within this trip two more times.. Okay, first things first. You might have read aa lot about Singapore before but did you really got an overview about what to do and where to stay plus – which sights are worth the prancing? Singapore is VERY different compared to the other Asian countries. First it is worth to mention that Singapore is more expensive than the usual Asian countries, so you better spare some pocket money for your trip. However, Singapore is totally worth the prancing and offers a lot, also for a lower budget. I spent 5 days in Singapore. There are diverse ways to get around the city. One can take the train but if you have some time I can totally recommend walking the distances, even it is a few kilometers, there is so much to discover that one will just miss within the train. I honestly found the best spots while just walking around and stop by. I didn´t do too many notes in advantage and scheduled everything spontaneously. Also in terms of safety Singapore is no place to be feared of. I was a solo traveler was even walking around in the night and I haven´t had any issues. Singapore is a very busy place and as always it´s still worth to keep one´s eyes open. The traffic is very busy so if you want to go around it´s still better to take the train or busses. The public transport system is easy accessible but please note that there will be no change in the busses, so it´s worth to exchange before the trip and to also have coins. There is also an exchange at the airport and I can recommend taking the train from the airport to the city, which is only 2,50 Singapore dollars, which is about 1,20€. China Town is a wonderful place to go and to stay at. Every Chinatown is different and Chinatown in Singapore is worth a visit with delicious food stalls around. It is also very close to temples, which are all over Singapore. A temple I was visiting was the Sri Man Temple, a very nice place to go, plus it´s free. Since I visited Singapore during Ramadan, I really wanted to go to the Sultan Mosque. It´s a beautiful sight in Singapore. Please remember to dress accordingly if you wish to go inside. However, also taking photos from the outside is nice. Also, the area around is good for exploring and eating out. 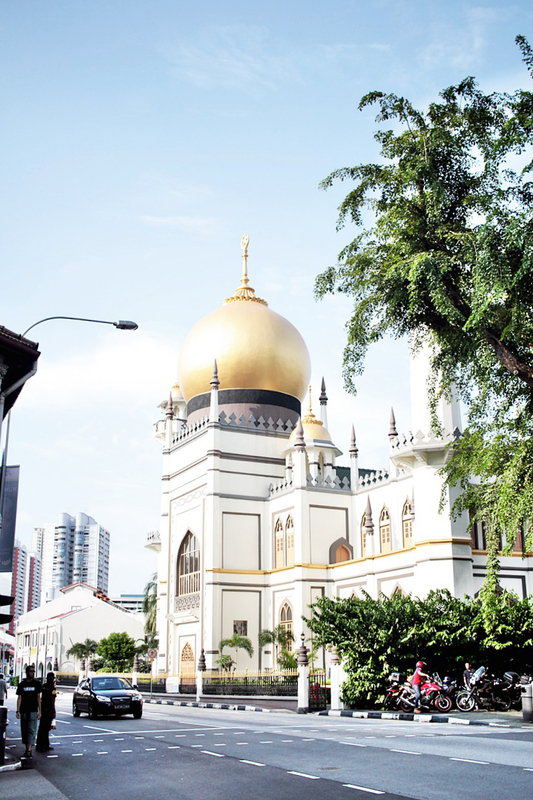 Close to the Sultan Mosque you guys can find the Arab street, which has one of the few cat cafés in Singapore. If you are a cat lover, you will “looooove” this place. As the name already says, you guys can cuddle cats at the café and enjoy tea, coffee and cake. The Entrance fee for coffee, cake and cute cats is 19 SGD. Singapore has many sights but to be honest, it would be just too expensive to visit all of them. So how about to catch them all within one trip? I was joining a river cruise at Clarke Quay. Clarke Quay is a wonderful place to go out in the night and it´s safe to explore. I was joining the river cruise in the night, as I wanted to see Singapore by night, with all the beautiful lights. If you want to pamper yourself in-between the trip I can recommend the Raffles hotel. It is the most expensive place in Singapore, but it´s such an experience. Even when one is not staying there, it is worth to explore the area. I had a spa treatment at the Raffles spa and I will do it again. You can read more about my experiece in THIS post. If you like eating Chinese food the Grand Mercure Singapore Roxy hotel is your place to go. With an authentic Chinese cuisine, this place offers original Chinese dishes and interior. The food is amazing and vegan options are given. Also, the hotel is a budget place to stay with a luxury atmosphere. You can get more impressions within THIS post. I didn´t visit the Mandarin Bay. For me it was a little to hyped and buys. Also, it was a little expensive. You might know the hotel, since it´s the one with the huge pool on the roof. However, the building is beautiful to look at when the sun goes down, plus you guys can enjoy a light show. Best place to watch the spectacle is from the opposite at Fulton hotel. The Merlion park is a perfect place for day and night. You can hand with your friend or partner around and watch the skyline and the Singapore flyer, so as the mandarina bay. It connects the most important sights of downtown Singapore and is a cool place to go to take the “tourist a like” photos. It was coincidence that I discovered the Buddha Tooth Relic Temple & Museum in Singapore. I couldn´t find it on my first attempt and when I was walking back to my hotel after a meeting I stopped by and saw the temple which is so beautiful. Make sure to go there when traveling to Singapore. The temple was unfortunately already closed when I walked by but still is such a fantastic place and a place to take photos at and of. The last stop I want to recommend are the Botanical Gardens, which are a little apart from the city. It is perfect for walks and if you like flowers and nature this is a must. The park is free of charge and you will face a different angle of Singapore. A magical place and again, a wonderful location for photos. I took some of the most beautiful photos over there during my travel to Singapore. I really love Singapore, and I will come back more often. I think the best part about Singapore is that there´s something for everyone. Nature, shopping, luxury, culture and city. How would it even be possible to dislike this place?